Don’t tell Steelers leading wide out JuJu Smith-Schuster that he’s not going to play in Sunday’s huge game down in New Orleans against the Saints despite a groin injury suffered in Thursday practice. Smith-Schuster is officially listed as questionable, but he said that he’s not of the mindset to be sitting – and letting down all those that have him on their team in fantasy football playoff games this weekend. The always smiling wide receiver tweeted out he’s going to play, and if you have him in your fantasy football starting lineup – don’t worry about him not giving it his all. Smith-Schuster is having a monster year for the Steelers with 95 receptions for 1,274 yards and six touchdowns. He has put together seven 100-yard games so far this year. The receiver has already surpassed last year when he had 58 catches for 917 yards and seven touchdowns. 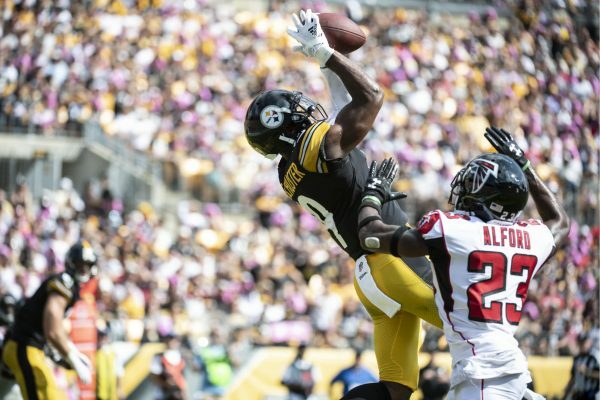 Be the first to comment on "Pittsburgh Steelers WR JuJu Smith-Schuster Says He’ll Play Sunday, So Don’t Sit Him in Fantasy Football"